O Jesus, Thou knowest how often my heart is sad. It is because I look for consolation and happiness in creatures, forgetting that Thou didst say "I am the way, and the truth, and the life." (John 14:6). I mourn in this vale of tears and fail to seek comfort where alone it can be found-in Thy Sacred Heart. At Holy Communion I drink at the very fountain of grace, holiness and happiness, because in It Thou dost give me Thy Sacred Heart, the Source of all grace, holiness and Christian joyfulness. O Lard, I believe that Holy Communion is the surest way to true joy, because It unites me in divine love with Thee, my greatest and most lovable God. True joy springs from divine love. How earnestly Thou dost invite me to this Banquet of Divine Love which Thou hast prepared for my soul so that I might partake of Thine own Body and Blood! "Come to me, all you that labour, and are burdened, and I will refresh you." (Matt. 11:28). As bread imparts to the body strength and a feeling of contentment, so does the Bread of Life bring peace and joy to my heart because of the wonderful fruits of grace which it produces in my soul. At Holy Communion there is opened to me a world of life, light and love, a gracious outpouring of the treasures of Thy Sacred Heart. O Jesus, the moments of union with Thee in Holy Communion are the happiest of my life. How much this union of love means to me! It is the climax of Thy divine love for me, and it should therefore be the object of my fondest desires. Thou hast made my heart for Thyself. It yearns to be with Thee and to possess Thee even here on earth, so that it may prepare itself for an eternal union with Thee in Heaven. At Holy Communion I enjoy a foretaste of Heaven, for I receive Thy glorified Body and Blood, Thy Soul and Divinity. O Jesus, Thou hast encouraged me to pray for this spiritual joy. "Ask, and you shall receive; that your joy may be full" (John 16:24). I pray for the grace to love Holy Communion as the source of true happiness. May Thy words to the Apostles be fulfilled in me through Holy Communion: "So also you now indeed have sorrow; but I will see you again, and your heart shall rejoice; and your joy no man shall take from yon." (John 16:22). In Holy Communion let me see Thee frequently with the eyes of faith, so that my heart may rejoice. This is the true and lasting joy which neither the world nor the powers of evil can take from me. May Thy true joy overflow into my heart�joy that will make me forget the storms and trials of life and the fleeting pleasures of time. O Jesus, make me resolve to tread underfoot all that is low and earthly, so that I may strive to find my rest in Thee alone. Preserve my soul from sin. It is the cause of all unhappiness in this world, since it deprives souls of Thy friendship. May frequent Holy Communion fill my heart with joyfulness that will make serving Thee a pleasure, even in the midst of the greatest sacrifices. Suffering may be my portion in life, but Holy Communion is my comfort It is a fulfillment of Thy words: "Blessed are they that mourn: for they shall be comforted." (Matt. 5:5). Thou dost love a cheerful giver. May I, like the stars that obey Thy bidding and give Thee glory by joyfully shedding their light in the heavens, serve Thee with joyfulness, conscious that I am a child of Thy love. heaven of delights when Thou dost visit me in Holy Communion. 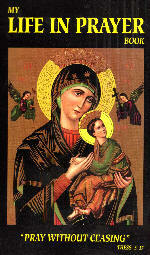 With Thine own dear Mother, I thank Thee for this great Treasure: "My soul doth magnify the Lord. And my spirit hath rejoiced in God my Saviour...Because he that is mighty hath done great things to me." (Luke 1:46-47, 49). 1. Where do you seek consolation when your heart is sad? 2. Does your love for worldly things prevent Our Lord from giving you that true spiritual joy which alone can make you happy? 3. Do you put as much effort into seeking your joy in God as you do in trying to find satisfaction in the passing pleasures of the world? 4. Are you eager to enjoy the friendship of Jesus in frequent Holy Communion? Aspiration for the day: O Jesus, my God, I love Thee above all things.